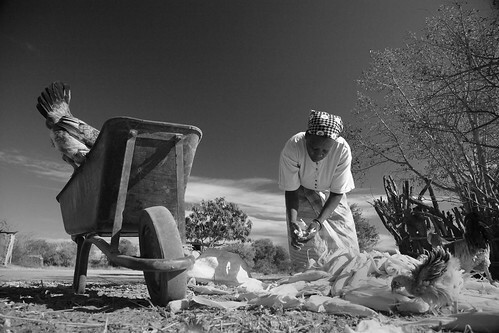 Farmer Celeste Sitoe tends to her maize and chickens on her subsistence farm in Lhate Village, Chokwe, Mozambique (photo credit: ILRI/Mann). ‘Africa will be amongst the hardest hit regions of the world as the climate heats up, threatening the continent’s food security, experts agree. If global temperatures rise 2.0 degrees C, southern Africa will warm an additional 1.5 degrees to a 3.5-degree increase on average. ‘Such temperatures could be reached as early as 2035. The Hadley Centre for Climate Prediction and Research in Britain recently advised that a 4.0-degree C rise in the global average temperature could be reached as soon as 2060 if the ever-increasing emissions of carbon dioxide and other greenhouse gases are not curbed. ‘”The prognosis for agriculture and food security in SSA (Sub-Saharan Africa) in a 4°C+ world is bleak,” write the authors of a special issue of the Philosophical Transactions of the Royal Society to be published next month. ‘”A four-degree C world would be horrendous and must be avoided at all costs,” said Philip Thornton of the International Livestock Research Institute in Nairobi, Kenya and co-author of a paper in the Royal Society special issue “Four degrees and beyond”. ‘”This special issue is a call to action so we can avoid such a future,” Thornton told TerraViva. ‘Even if a new climate treaty came out of the final week of the 16th meeting of the Conference of Parties (COP) of the U.N. Framework Convention on Climate Change in Cancún, 2.0 degrees C looks inevitable, he said. No one is realistically expecting a comprehensive climate treaty for several years. This means southern Africa can expect to be 3.5 degrees C hotter and much drier in future, he said. ‘”It is going to get very difficult for rain-fed agriculture in this region,” Thornton warned. . . .
‘A great deal of work will be needed to help farmers adapt to these new conditions, including the development of heat and drought-tolerant varieties, said Thornton. Learning from other regions with conditions similar to those expected in southern Africa in the next 20 to 30 years, as well as bringing seeds from those regions, has to be part of the adaptation strategy. ‘It also means that water-hungry crops like maize will need to be replaced by cassava, millet and sorghum. That involves social change since local people largely prefer maize and food preparation of those other crops is different and may be more difficult, he said. “It’s a towering challenge,” Thornton noted. . . .
‘By 2050, countries in the Sahel, the region south the Sahara desert, will experience crop-growing conditions for which there are no current analogues globally, said Sonja Vermeulen, deputy director for research at the Programme on Climate Change, Agriculture and Food Security launched last week in Cancún. ‘This is a 10-year, $200 million research initiative cope with climate change impacts on agriculture. It hopes to reduce poverty by 10 percent in targeted regions and lower the number of rural people who are malnourished by 25 percent by 2020. ‘Those unprecedented climate conditions make it difficult if not impossible to grow food. There may be no possibility of adaptation without significant outside resources, Vermeulen said in a statement. . . .
‘Previous studies have shown that under 2.0 degrees of warming, global grain prices will likely double by 2050, if not before. An additional 25 million more children could be malnourished, said Gerald Nelson, a researcher at the International Food Policy Research Institute in Washington. ‘Those studies only looked at changes in temperatures and precipitation and “the month to month variations were dramatic”, Nelson told TerraViva. The impacts on livestock have yet to be incorporated. If temperatures continue to rise by 3.0 and 4.0 degrees, it will be very hard to do anything to adapt in many parts of the world, he said. ‘Even with a +2 degrees C hotter world, the real scale of the problem of food security in Africa has been heavily underestimated and will require massive investments, Thornton concluded. Read the whole article at IPS/TerraViva: As world warms, southern Africa swelters, 7 December 2010. Tags: 2010 COP16 climate conference (Cancun), Gerald Nelson, IFPRI, IPS/TerraViva, Philip Thornton, Sonja Vermeulen. Bookmark the permalink.